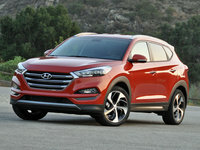 CarGurus has 25,074 nationwide Santa Fe listings starting at $999. One of the more popular choices in the crossover market is Hyundai’s uber-capable Santa Fe. This 5-door midsize family- and commuter-oriented people-hauler returns for the 2016 model year with a nip here and a tuck there but no truly earth-shaking changes. Additionally, look for this well-wrought and value-laden mini-ute to remain offered in both the 5- to 7-passenger Santa Fe and the 5-passenger-only Santa Fe Sport versions. Each version will again boast standard front-wheel drive (FWD), while the option of a full-time all-wheel drivetrain (AWD) is again available to all trims in both the Santa Fe and its Sport derivative. Trims in the Santa Fe stable again include the base GLS and the up-featured Limited, with the Santa Fe Sport returning in a pair of iterations, the entry-level Sport and the turbocharged Sport 2.0T. Changes for the 2016 Santa Fe, meanwhile, are expected to encompass a larger grille, upgraded standard front fog/driving lights, new taillight graphics, and reworked cornering headlights. There are also hints from the Korean automaker that an available rear-seat DVD entertainment system is in the works for the 3-row Santa Fe in this upcoming year. A further enticing rumor is that the Santa Fe trims boasting 3-row seating may be offered with an available 2.4-liter turbodiesel inline 4-cylinder (I4) powerplant that’ll boast significantly more grunt, not to mention improved fuel efficiency. Look for the non-Sport Santa Fe to return for 2016 packing the traditional 3.3-liter normally aspirated V6 engine, again mated with the standard 6-speed shiftable automatic transmission. Expect 290 hp and 252 lb-ft of torque from this peppy powertrain, with mileage estimated at 18 mpg city/25 highway/21 combined in FWD versions, and 18/24/20 in AWD variants. When the Limited is upgraded with the numerous add-ons in the optional Ultimate package, meantime, mileage estimates will remain 17/23/20 in FWD garb, with AWD iterations returning an estimated 17/22/19. The base 2016 Santa Fe Sport is slated to reprise the non-turbocharged 2.4-liter I4 powerplant, again combined with the 6-speed shiftable automatic for 190 hp and 181 lb-ft of torque. FWD versions of the Sport trim level are expected to get 20/27/23, with AWD variants expected to remain 19/25/21. The Santa Fe Sport 2.0T remains toting a standard 2.0-liter turbocharged I4 engine, again hitched to the 6-speed shiftable automatic to the tune of 265 hp and 269 lb-ft of torque. Without the Ultimate package, the 2.0T is expected to return boasting 19/27/22 in FWD versions and 18/24/21 in AWS iterations. With the Ultimate package features added, look for the 2.0T’s mileage to drop to a still-impressive 19/26/22 in FWD trims and 18/24/21 in AWD variations. By the way, the folks at Hyundai are also dropping hints here and there of a hybrid Santa Fe that may make it to dealer showrooms for the 2017 model year. Complementing the expected appearance upgrades in each 2016 Santa Fe trim level are such carryover offerings as 17-, 18-, or 19-inch alloy wheels, a rear spoiler, and a roof rack. Inside, look for both the Santa Fe and the Santa Fe Sport to boast, depending on the trim selected, such perks as cloth or leather upholstery, heated front seats, power-adjustable front seats, sliding and reclining second-row seats, and full power accessories. Of course, cruise control, telescoping tilt-wheel steering, and automatic climate control are slated to return for the upcoming year in all variations, along with a rear-view camera and the popular Blue Link infotainment feature that interfaces with Bluetooth hands-free communications. Standard entertainment features, meantime, include a single-CD player with 6 speakers, satellite radio, and HD Radio, all integrated via a 4.3-inch display. The 2016 Santa Fe Sport 2.0T, furthermore, is expected to return toting a standard power sunroof, a heated steering wheel, and memory for driver's settings above and beyond the more plebian offerings of its lesser siblings. Optional features in both the Santa Fe Limited and the Santa Fe Sport 2.0T include the already noted Ultimate package, which additionally adds rear parking sensors, GPS navigation, heated rear seats, and Infinity premium audio with 12 Surround Sound speakers to the features mix. Further available upgrades to the non-Sport Santa Fe include a trio of seating configurations, a remote garage door opener, and a tow hitch and wiring. The Santa Fe Limited and Sport 2.0T, additionally, can be delivered with an optional Saddle Leather package that offers upgraded leather upholstery. And don’t forget that rear-seat DVD entertainment is a rumored option in the 2016 Santa Fe lineup. Standard safety equipment aboard all Santa Fe iterations, Sport and non-Sport, include 4-wheel antilock brakes (ABS), traction and stability control, front side-mounted airbags, front and rear head airbags (Sport), and 3-row head airbags (non-Sport). The Sport versions also throw in a driver’s-side knee airbag as well. Additionally, look for the 2016 Santa Fe to return with standard daytime running lights and front fog/driving lights, as well as Blue Link emergency telematics that boast a MyFord-Touch-like programmable speed and audio limiting system that’s aimed primarily at teenage drivers. Furthermore, the Santa Fe Limited and Sport 2.0T pack standard blind-spot monitoring with lane-changing assistance, not to mention rear cross-traffic alerts and turn-signal-integrated mirrors. Both government and the insurance industry give all Santa Fe iterations high marks in their various safety testing criteria. A few owners have complained that the current Santa Fe cabins are a bit noisy, with at least one owner describing a few disconcerting rattles. 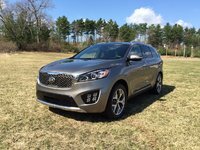 For the most part, however, this midsize crossover is lauded for its ride comfort, safety assets, interior ambiance, and overall value. The 2016 Santa Fe Sport is now on sale, with its 3-row sibling due to show up at dealer showrooms in the fall of 2015. And, of course, both editions will once again challenge Ford’s legendary Flex, Chevy’s heftier Traverse, Kia’s comfy and stylish Sorento, and Dodge’s classy Durango in the midsize crossover niche. What's your take on the 2016 Hyundai Santa Fe? Robert I bought a 2015 SF Limited Ultimate in February 2015, and my wife and I enjoyed it immensely, right up till a pickup crossed directly in front of us while we were on a 60 mph divided highway. The safety systems worked fantastically, but the car was totaled. We replaced the SF with an identical 2016 model within seven days and my first thought was: it's quieter. I said nothing to my wife, yet she immediately commented that she thought it was quieter. Not that the 2015 was particularly loud, but I think Hyundai may have added more sound absorbing material for 2016. Other than that, I can't detect any differences at all. 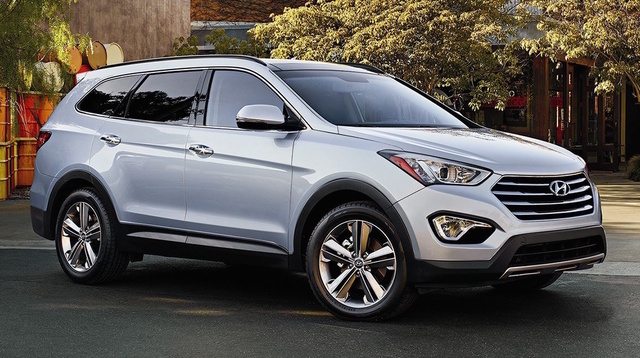 Have you driven a 2016 Hyundai Santa Fe? 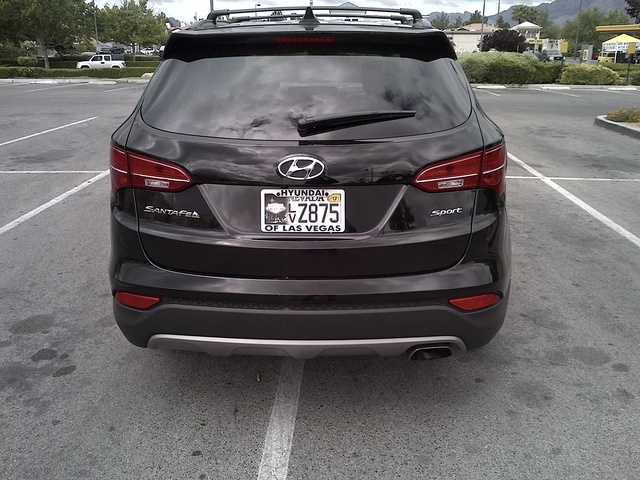 What Does The 2016 Hyundai Santa Fe Se Towing Package Consits Of?